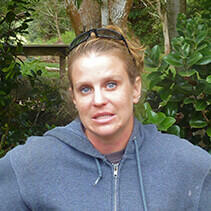 Lisa Komarczyk serves San Diego Zoo Global as a Senior Research Associate in Recovery Ecology. She began her career with the Hawaii Endangered Bird Conservation Program in 2005 as an intern and is currently based at the Keauhou Bird Conservation Center. Lisa’s responsibilities include managing the ‘alala flock, work which intensifies during the breeding season. Lisa spends her days in the video monitoring room where she scans through hours of footage along with watching live video feed, looking for key behaviors that help her make decisions such as how to manage pairs and when to collect eggs. Lisa is originally from San Jose, California. She earned bachelor’s degrees in Biology and Art Studio from University of California, Santa Barbara.